St Bees Sandstone, sourced and processed by Denfind Stone, to meet the criteria for our client’s self-build project in the Glamis area. Denfind Stone now have a range of stone to offer our customers, whether it is to match the existing stone on an extension, to satisfy the conditions of the planning department, or just personal taste. Give us a call to discuss your stone requirements. Project designed by Robin Baker Architects. 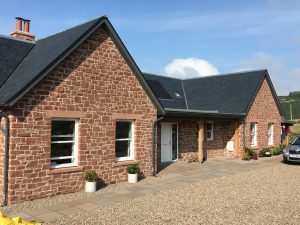 At Denfind, we have been working closely with a local architect to source a red sandstone to meet the specific wishes of his clients for their new build project. 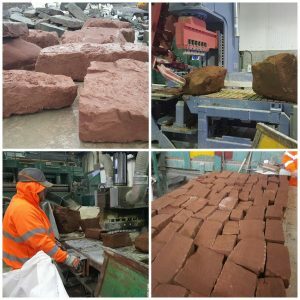 Several loads of St Bee’s sandstone have recently been delivered to Denfind and is now being processed through our range of guillotines. The stone will be delivered shortly to a site in Angus for the cladding of a new dwelling house. As a founding member of the Scottish Stone Group, Denfind Stone works closely with other leading Scottish stone companies allowing us to source and process a range of different stone types to meet a wide variety of requirements. So whatever your stone requirements, give us a call and we will try and come up with a solution. You can reach us on 01382 370220. © Denfind Stone Ltd, The Spirit of Scottish Stone. 2017. Our terms and conditions are available on this website HERE with hard copies available by request. © Denfind Stone, The Spirit of Scottish Stone. 2016.